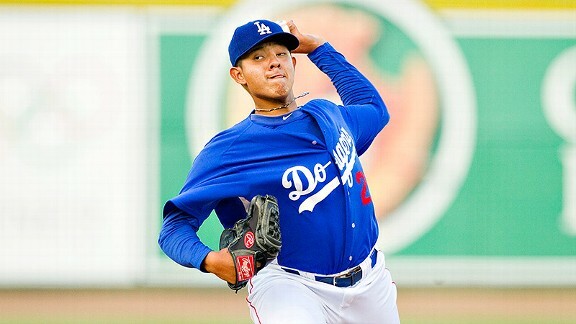 Pitchers (6): Chris Anderson, Lisalverto Bonilla, Brooks Brown, Jose De Leon, Julio Urias, Matt West. Outfielders (3): Corey Brown, Alex Hassan, Rico Noel. There will be more NRIs in the days and weeks leading up to camp — probably more veterans than rookies. Read more about the initial group here. This entry was posted in Breaking news, JP on the Dodgers, Spring Training and tagged Alex Hassan, Brooks Brown, Charlie Culberson, Chris Anderson, Cody Bellinger, Corey Brown, Elian Herrera, Jack Murphy, Jose De Leon, Julio Urias, Kyle Farmer, Lisalverto Bonilla, Matt West, Rico Noel, Rob Segedin, Shawn Zarraga by J.P. Hoornstra. Bookmark the permalink.